Monkey see, monkey do, or so that is how it has been for quite a fair number of years already – or should I say, generations. Having said that, it is interesting to know that you do not have to purchase another iPad for your toddler simply because he or she sees you using yours, and wants one, too. VTech knows this, which is why they have come up with the InnoTab MAX tablet for children. The VTech InnoTab MAX will be different from other tablets, as it will merge VTech’s expert-supported library of cartridges, software and apps alongside carefully selected educational Android apps, resulting in the best of both learning worlds as well as the widest variety of curricula to provide a superior children’s tablet. Each InnoTab MAX purchase will result in a free educational bundle that will boast of 8 apps, in addition to a free Toca Boca app, right after they register their tablet on the Learning Lodge app store. Parents will be able to pick from a bundle that focuses on a single subject area, including Language Arts, or to pick a bundle that covers a wide range of skills appropriate for their child’s grade level. Not only that, with access to more than 850 educator-supported VTech and Android apps, you would be spoilt for choice. 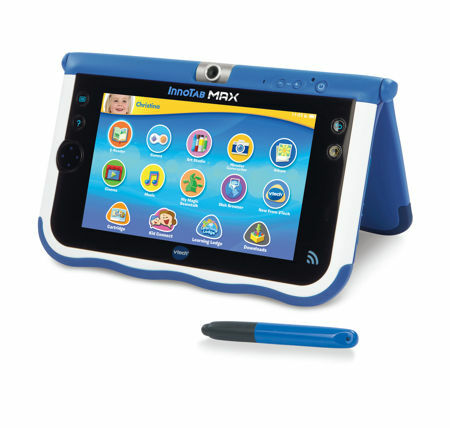 The InnoTab MAX will be powered by a dual-core CPU with up to six times the processing power of previous generations, accompanied by a high resolution 7″ multi-touch screen, a built-in rechargeable Lithium battery, Parental Controls that enable you to have a greater degree of control over what can and cannot be used, as well as a progress log in order for parents to follow their child’s learning development. Targeting those aged between 3 and 9 years, the InnoTab MAX can be yours for $99.99 a pop, where this could be an early Christmas present.